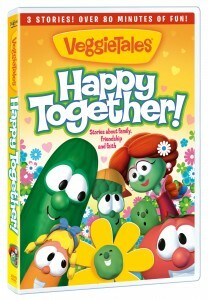 Veggie Tales has released a new video called Happy Together! Sheerluck Holmes and the Golden Ruler takes you on a mysterious adventure with Sheerluck Holmes and his venerable sidekick Dr. Watson as they work together, their forensic fortitude can solve any crime. The Grapes of Wrath… What do you get when a bunch of very cranky grapes make fun of Junior Asparagus? One sad asparagus and one big problem. Will Junior ever be able to forgive them?! Esther The Girl Who Became Queen tells the story of a new queen. When Esther has the weight of the world on her shoulders and the fate of her people in her hands, can she find the courage to do what’s right?! Bonus Silly Songs! Pants, Dance of the Cucumber, and Larry Sings the Blues. My favorite is Sheerluck Homes and the Golden Ruler. It’s always important to remember the Golden Rule and Larry, aka Sheerluck Holmes, keeps taking credit for all of the for all the crimes that the team solves. You can never go wrong with a Veggie Tales DVD. It is one of the few kids shows that I’ll actually sit down with the kids and enjoy. You can buy Happy Together at Amazon , on Big Idea, Target, Walmart or at other local Religious stores. 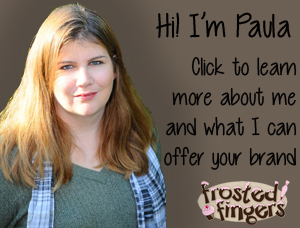 I like frosted fingers on fb Shawna C.
Tell me how you will celebrate Valentine’s Day with your kids this year. Giveaway is open to US readers only. It will close 2/22/11. A big thank you to Big Idea for giving me a DVD to review and one to the winner. Winner will be selected by the And The Winner Is plugin. Winner will be posted here on Frosted Fingers and notified by email. Winner will have 48 hours to claim the prize. I was given the movie Happy Together for free to review but all opinions are mine. We are cooking at home and having a Valentine’s Day for three! (Us and little man)…since he’s our Valentine too. I am making a Valentine Monster Cake with them. 🙂 We might surprise Daddy at work with it! Shhhh… don’t tell! LOL! They get to open their gifts from (and their Valentine’s from their classmates) and then we’re gonna do some baking! My daughter is in a play on V-Day, so we will be there watching her. I make heart shaped pancakes for breakfast. We are going to make special Valentine cookies together. I am making a very large valentine heart shaped chocolate chip cookie with the kids and sharing it with the kids in my Sunday school class. I will get the each a card and a special treat. I’ll decorate the dining room table, make dinner and a special dessert. 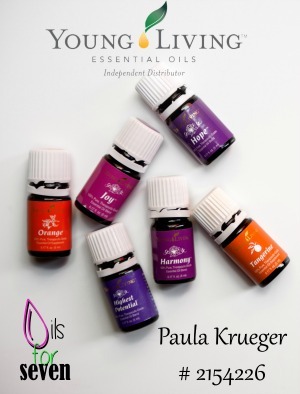 And of course, they’ll be a small gift for everyone! Thanks! Valentine’s Day really isn’t any different than any other day. We cherish each other and each day equally. I “Like” Veggie Tales on Facebook. I will be giving my daughters some small gifts and then we will make our annual trip to the local Thai restaurant for dinner. We usually make cookies together and have a movie night. I’m a Google Friend Connect Follower as nightowl. #1 I Subscribe to Frosted Fingers via RSS. #2 I Subscribe to Frosted Fingers via RSS. We celebrated by making and exchanging Valentine cards, reading some Valentine books, making cupcakes and playing games. I like Veggie Tales on facebook. I made cookies for my niece and we decorated them together! We went to a valentine’s party! I am making a Homemade Valentine candy ! This year, we made really nice cards for each other…it was a lot of fun. For Valentines this year I made heart shaped pancakes for breakfast and gave each of my children a stuffed love monkey and a small basket of candy in the afternoon. I am a fan of Veggie Tales via Facebook as Jill Myrick. I am following Veggie Tales via Twitter as jlsc123. We exchanged chocolates and enjoyed flowers. My daughter had dance so we all went to that and we had a nice dinner. I exchanged with my daughters cards and candy. Also, I prepared their favorite dinner which is chicken wings and mac and cheese. Ice cream & a new book! We made Red Velvet Cupcakes! I made the kids heart shaped brownies for dessert. I like veggie tales on fb Shawna C.
We had a lovely dinner and ate heart shaped cake. We made mini heart pizzas.